The San Jose Jr. Sharks are making changes to the structure of their girls program with a focus on streamlining the older age groups. Beginning in the fall, the Jr. Sharks will launch a 17U AAA team, but because USA Hockey doesn’t have a 17U AAA classification, that team will declare as a 19U AA team to compete at the Pacific and National levels. The 17U AAA team will also play at all the major North American tournaments at that level with the hopes of maximizing exposure in front of college coaches. Locally, the 17U AAA squad will also compete in the Northern California league. Additionally, in the hopes of continually feeding players into the 17U team, the Jr. Sharks have established a 16U AAA/AA team that will compete alongside the 17U AAA throughout the season. The Jr. 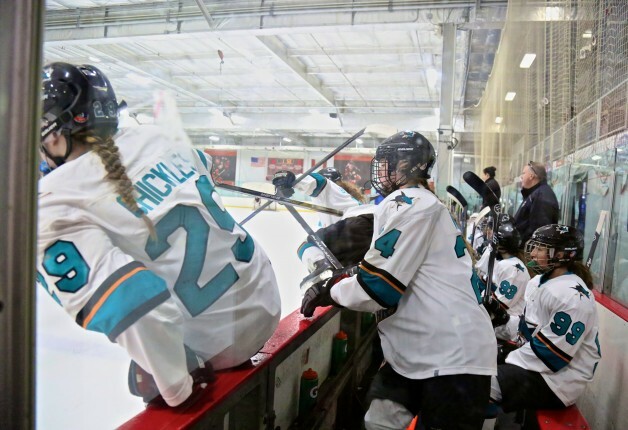 Sharks organization feels that by creating an elite 16U program to pair alongside the 17U, more opportunities will be created to give elite players more exposure. Finally, with an eye on maximizing options for girls throughout the organization, the Jr. Sharks also announced that they have established a team that will play in the Sharks High School Hockey League, where the level is geared more towards players who want to experience the competition without as much of a commitment. The Jr. Sharks will still have girls teams at the 8U, 10U, 12U and 14U levels. Prior to the shakeup, Long said it was often challenging to field a team at the 19U level, as most girls graduate high school at 17 or 18 and leave the program to go to college. By adding a hybrid 17U AAA/19U AA team, the Jr. Sharks gain some added personnel flexibility while at the same time allowing the players to play at the highest level possible against the best competition, thereby maximizing the opportunity for exposure to college scouts. An added bonus to adding a team at this age group is that the age range matches more closely with the Canadian system, which gives the Jr. Sharks more opportunity to play against elite Canadian teams. Not to be overlooked is the addition of the first girls high school hockey team, which will play against boys teams next season. Ultimately, these changes were implemented to help promote and develop competitive hockey within the Jr. Sharks organization.